One for the weekend Explorer, spend two-and-a-half days in Morocco's Atlas Mountains trekking to the summit of North Africa's highest peak, Jebel Toubkal (4,167m). Enjoy panoramic views and discover the exotic backstreets of Marrakech on foot. Marrakech is the spiritual heart of Morocco, the cultural melting pot of the mountain Berbers and the desert peoples of the south, whose eclectic mix of ideals and traditions has resulted in a fascinating clash of colour, noise and visual delights that is straight out of the 'Arabian Nights'. If you have time on arrival you could take a look around the Old Town. The group introductory meeting will take place this evening. Leaving the city behind we drive south today, towards the craggy peaks and plunging valleys of the Toubkal Massif. Crossing the Haouz Plain we pass through the tiny town of Asni, from where our road begins to climb towards the foothills of the Massif. Below us the valley of the Oued Rhirhaia stretches out into the distance and small villages cling to the sides of the steep hills as we meander our way towards the village of Imlil (1740m). Here we leave our vehicle and, in the company of our mountain guide, begin our trek, heading along the Mizane Valley, first towards the village of Aremd (1900m) and then onto the shrine of Sidi Chamarouch. Built on a moraine spur overlooking the valley floor, Aremd is the largest village in the valley and provides an interesting mix of traditional terraced farming, gites and streets that seem to be permanently gridlocked by goats and cattle. For generations the local Berber villagers have worked these lands, producing corn, potatoes and walnuts from the harsh landscape. Continuing across the flood plain our route takes us along mule tracks and up into the high rocky cliffs above the valley. Crossing the river we eventually come to the pastoral shrine of Sidi Chamarouch, which attracts tourists and pilgrims alike (although only Muslims are allowed to cross the stone bridge to visit the marabout shrine itself). The village sits besides a small waterfall, a jumbled cluster of houses that seem to melt together into an anarchic mass. From here the trail continues to climb steadily, snaking and zigzagging its way up to the snowline and our camp (3206m). Today's 11 kilometre walk is expected to take around five hours with a total ascent of approximately 1,460 metres. Early this morning we make our attempt on the summit of Jebel Toubkal, the highest peak in Northern Africa. Our route takes us up the south cirque, crossing the stream above the refuge and then heading across one of the mountains numerous scree fields, where we will have to negotiate a seemingly endless carpet of boulders and rocks. The walking is relatively straightforward, but the scree and the altitude will make the going quite difficult in parts, however, the views along the way make the journey more than worthwhile. Cresting the ridgeline we find ourselves on the plateau, from where it is a short walk to the summit and the vistas out across the surrounding landscape are quite breathtaking. From here there are unrestricted views in every direction, from the Marrakech Plain to the High Atlas in the north and as far south as the Anti-Atlas and the Sahara. Pliny, the great Roman scholar, once described the High Atlas Mountains as 'the most fabulous mountains in all of Africa' and from our vantage point high above the valley it is easy to understand why. Retracing our steps we then return down the mountain and head back towards Aremd (1900m), where we will spend the night in a village house. Today's 20 kilometre walk is expected to take around 10 to 11 hours with 967 metres of asecnt and 2,217 metres of descent. Returning on foot to Imlil (1740m) this morning, we then drive back to Marrakech where, on arrival, you will have some free time to explore the city's colourful souks and its celebrated Djemma El Fna Square. A feast for the senses, the area is a chaotic confusion of noise and colour, where you will find the streets alive with storytellers and letter-writers, musicians, jugglers and watersellers. There is the option to take an afternoon walking tour around the souks with a local guide, also visiting the museum and the elegant Koutoubia mosque and tower, reputed to be the most perfect Islamic monument in North Africa. Marrakech is divided into two distinct parts, the Gueliz (or modern French-built city) and the Medina (the Old City) and you may prefer to spend your final afternoon independently exploring its maze of narrow streets, filled with the sounds, colours and smells of the exotic, perhaps haggling for some last minute presents, or just sitting in a café and watching the street tableaux unfold before you. Your tour ends today in Marrakech after breakfast. Depending on the schedule of your flights, you may be able to spend some additional time wandering in the souks of the 'Red City' or buying the last souvenirs. One main piece of baggage and and a 20-30 litre day sack is recommended. You will need to carry what you need for the day which may include a raincoat, jumper, camera, sun-cream and water. It is preferable to bring your luggage in soft holdalls rather than a large suitcase - as it is easier to pack them on the vehicles and the mules. It will be possible to store unrequired and additional luggage at the hotel or with our agent in Marrakech during the trek. Local Crew: Although entirely voluntary, tipping is a recognised part of life in this region of the world. Some local staff will look to members of the group for personal recognition of particular services provided. Accordingly, you should allow approx. £15 per person for tipping of crew and local guides used. For all departures (except ATA 26 Sep 2019) we have upgraded the hotel in Marrakech, located in the new city centre with a half hour walk to the main Jamaa El Fna Square. The hotel has a rooftop swimming pool and a restaurant, the rooms are air conditioned. On day three in Armed we stay in a traditional Berber village house. There are number of twin or triple rooms with shared facilities, and a communal area for eatingocialising, and roof terrace too. All bedding is provided. These are a fantastic way to meet the local Berber people and gain an insight into their lives. Trek for 5 hours on the first day and 10 to 11 hours on the second. Short walk to return to Imlil. Maximum altitude 4167m. Paths generally well defined but rocky mule tracks. 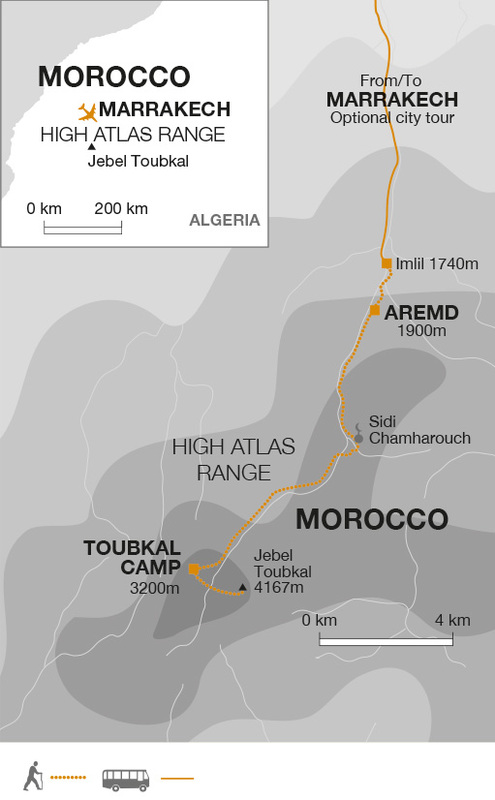 The ascent and descent from Toubkal is on uneven paths with rocks and scree in places. Trekking poles are recommended particularly for the descent. Please be aware that there may be snow on the summit particularly at the beginning of the season. Mules carry the luggage.